The Cynothropeling is a canid-based lifeform. The Borderling must've evolved from a Classic Age Borderling. It resembles a domestic dog similar to a husky or a wolf. Its body is strong and sturdy, showing signs of musculature below its fur. Its fur is smooth and supple to the touch and is a maroon color with a light-red underbelly and paws. Its head is an off-white canine skull with sharp, polished fangs. Translucent horns jut out from the top of its head, claws and shoulder blades. 30% of the Cynothropelings will grow larger horns on their elbows and ankles. Each horn is flat and is 1.2 inches at its thickest. In its eye sockets are purple tubes with the same consistency as its horns. Inside the Cynothropeling's body is a crystalline gel, the source of the horns that protrude its body. Its skin is flexible yet thin. A thick, dark purple substance will ooze out of an open wound. The Ichor will harden and crystalize around the cut, forming into more horns. 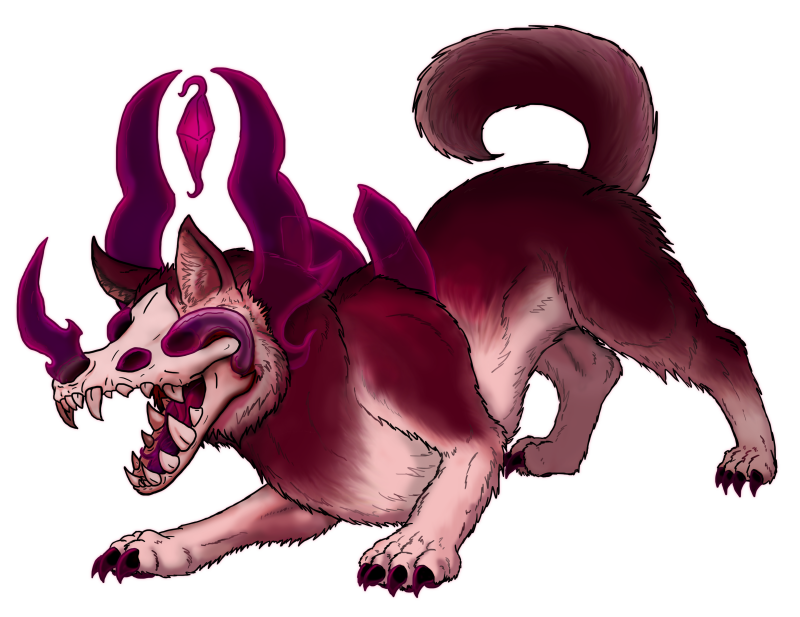 Growls and barks emit from inside the Cynothropeling, although it doesn't move its jaws. The guttural noises will sometimes overlap or trail off until it becomes a long droning hum. An impure Cynothropeling has unhealthy, sagging skin. The gaping holes around its body allow more ooze to drip from its body. Because of the constant hardening of the dark substance, the Borderling's limbs will become stiff shortly after entering Earth. Soon afterward, it becomes immobile and will die from the lack of food. The Cynothropeling appears in and around rural areas and, on rare occasions, in suburban areas. Hills and mountainsides also have a chance of having a Cynothropeling pack or two. It travels to and from our dimension as a crystal formation on the ground. Ooze will pool around it, forming the shape of a canine. A layer of skin and fur will soon cover the gelatin shape. After formation, it remains stationary. Once it gets on its feet, the Cynothropeling examines itself, checking for any malformations. If the Borderling's limbs are working fine, it searches for others of its pack. Cynothropelings have a slight change of becoming disfigured within the process. Locked joints, loose skin, and a deformed skull are a threat to a single Cynothropeling. Therefore, they will become impure or dead within the next 8 minutes upon arrival. When exiting Earth's dimensional plane, The Cynothropeling will breathe in a purplish gas that creates a thin layer on any vertical surface. While running head first into the portal, it begins to howl. Other Cynothropelings around the 2-mile radius will hear it, knowing it is time to leave. Once after the Borderling leaves, the portal closes. A discolored stain will be all that is left afterward. The Cynothropeling is loyal to those who chose it as their own personal Borderling. It will not leave its owner's side and will sacrifice itself to ensure the owner's survival. Its gait is loose and bouncy. When in a trot, it picks up its feet while holding its head up proudly. When not around a human being, it finds others of its kind. A healthy pack will have up to 10 Cynothropelings. Once one of the pack members find a potential human companion, it separates from the group. A single Cynothropeling will lower its head down like its picking up a scent. In reality, it's using its horns to detect frequencies of Borderlings nearby. If it doesn't find another Borderling, it will insert itself as a personal Borderling. After a day has passed, it will decide either to transform the human or to leave them be. If the person already has a personal Borderling, the Cynothropeling will attempt to fight the other. The Cynothropeling has to be extremely careful around Borderlings that are stronger than itself. Any injuries that are fatal to the Cynothrope will leave it useless. It eats almost any dead Borderlings that it comes across, including fallen pack members. Devouring the crystalline flesh of another Cynothropeling will provide strength and growth to another. The Cynothropeling relies on its blood to defend itself. 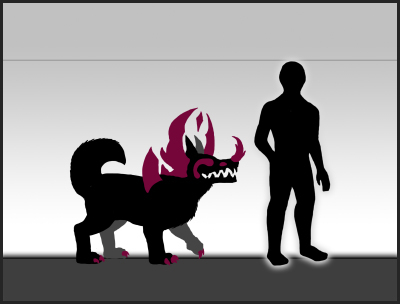 It can change any Witness into larger, stronger versions of the Borderling's species. With its claws and teeth, it can bite down to deliver its blood as a form of venom. The infection is visible around the wound, pulsing for 2 to 3 minutes. The transformation won't start until the person is within 10 feet within the Borderling's presence. The Cynothropeling's horns emit a hypnotic aura. Once the affected human takes a glance at the Borderling's horns, they will go into a trance. They will behave almost exactly like a dog under the influence of the Cynothropeling's aura. Only when the Cynothropeling exits our dimension that the Witness turns to normal and regain consciousness.